Terribly sad about Ms. Wilding. Someone should do a grave rubbing, it seems, before all traces are gone. Thanks to you and Miss Holman for braving the brambles. It was great yesterday, I enjoyed it a lot! 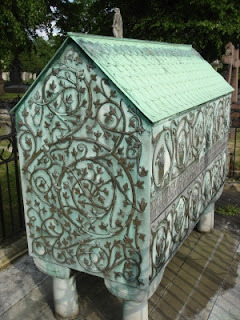 It would be wonderful to record info and write a guide about pre-raph stunners and artits' graves! Glad you had a good talk. I've photographed in both these cemeteries and they are wonderful but wish they had more money spent to preserve them. They are such a good record of our history. The talk on Saturday evening was wonderful. I recognised you from your photographs and wanted to say hello and to thank you for your wonderful blog, but found it a bit awkward at the time (I did manage a "that was interesting" to you at the door!) Regarding Alexa Wilding, she does appear to have a much lower profile than the other models. I read in wikipedia today that in fact Rossetti painted her more often than all the others. I must admit, it's only recently that I realised that many of the paintings which I had assumed were of Jane Morris are actually of Alexa! Oh heavens! You should have come over! I'm sorry if I didn't reply, it was a ll a bit of a blur trying to get out, there were so many people and Miss Holman was attempting to get us back to Waterloo! I'm glad you enjoyed yourself, it was a good evening :) Yes, Alexa was the most, but because of no recorded relationship between them we overlook her because there is no juicy detail. There are definately times when Alexa and Jane blend, which is interesting. Thanks to everyone for your comments and fingers crossed for some more talks later in the year! What a great post! I wish I had been there with ya, too! But knowing you made the trip is just awesome. And yes, yes, you are a born writer. I can't wait to see what you do with Alexa! LOL! Oh, I love the idea of a stunner grave tour! And how sad about Alexa's. I feel weirdly guilty that I don't know anyone who favors her first, the way so many of our online Sisterhood do with Lizzie or Fanny or Jane. I wish we knew more about her. Thanks for the comments. Hopefully soon people will start expressing their Alexa Love first and foremost ! Hi Sarah, thanks for posting this! Unfortunately, this isn't our Fanny Cornforth (although maybe a relation of her husband Timothy Hughes/Cornforth) as Fanny, or Sarah Schott as she was by then, was still alive in the 1890s and as far as 1906 when she was in contact with Samuel Bancroft Jnr. It was a hard job just to get to it,nice to see it looking so good. Thanks once again for all your hard work and sharing your info.